ROLLING STONES / SANTANA / CHEECH & CHONG concert ticket stub 1-18-1973. 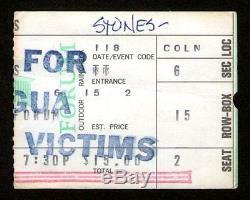 RARE stub from the benefit concert the Stones played to aid the victims of the Nicaraguan Earthquake that occurred in late 1972. 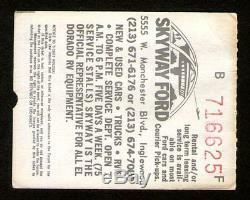 Most, if not all, of the tickets were stamped on the front as it was a one-time benefit show. First show of the 1973 Pacific Tour / Australasian Tour / Winter Tour. Venue & Location: The Forum, Inglewood, California. The item "ROLLING STONES Concert Ticket Stub 1-18-1973 Nicaraguan Earthquake Benefit" is in sale since Tuesday, December 22, 2015. This item is in the category "Entertainment Memorabilia\Music Memorabilia\Rock & Pop\Artists R\Rolling Stones\Concert Memorabilia". The seller is "musicabilia4u" and is located in Denville, New Jersey. This item can be shipped to United States.